Eldridge Lift-Top Cocktail Table Mixed material lift-top table truly elevates rustic-industrial style in the Eldridge lift-top cocktail table. Weather-washed pine wood and veneers are contrasted with canted metal legs and corner bracket accents for a uniquely chic merger of earthy beauty and contemporary flair. A handy spring-loaded mechanism brings the tabletop to you, while two drawers with removable storage trays are packed with possibilities. Mixed material lift-top table truly elevates rustic-industrial style in the Eldridge lift-top cocktail table. Weather-washed pine wood and veneers are contrasted with canted metal legs and corner bracket accents for a uniquely chic merger of earthy beauty and contemporary flair. A handy spring-loaded mechanism brings the tabletop to you, while two drawers with removable storage trays are packed with possibilities. This piece is horrible. Beautiful look but cheaply made. It chips everywhere. I'm actually going to contact them for a replacement. We're sorry you feel unsatisfied with your purchase. If you would please send your order details, contact information and a copy of your concerns to rfcare@raymourflanigan.com we'd love to see how we can help. I saw this piece online first and after visiting the R&F outlet store I was sold. Great construction, came fully assembled and placed directly where I wanted it by the delivery guys. I love the top that lifts up, perfect for eating in front of the TV! and the drawers are a bonus for storage. Love this table! Got both this one and the matching end table, and they look great in the den. The lift top is easy to use and is great for those who eat in front of the TV. Slight smell at first, but fades quickly. Would definitely recommend. Esthetically pleasing and functional. Easy to clean for young kiddos. Matches our new Romily sofa. Easy to maneuver the raised table for eating and entertaining. Love the pop up section for eating! 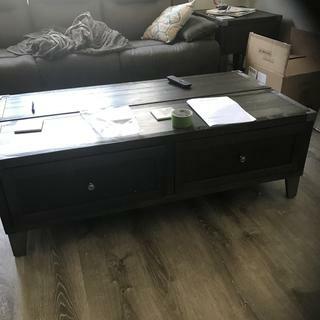 Was just looking at the local Raymour and Flannigan and came across this awesome cocktail table that matched my living room furniture. So brought it and happy I did. It looks great, has drawers, and half of the top opens up to a higher level to use as an eating table also. This table brightens up our room and offers so much space and the lift top is a bonus. Highly recommend!! Very well built for the price, the lift top is great for my kids! 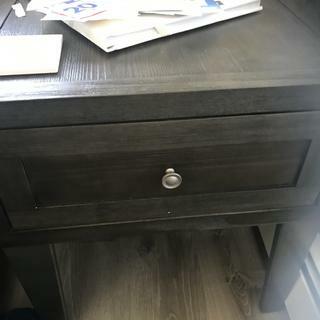 WHAT COLOR WOOD IS THIS TABLE? It’s like a grayish color. Do you think the lift top part of the table is sturdy enough to work with a large-ish laptop while lifted? BEST ANSWER: Ashley Furniture does not provide a weight capacity, but a laptop should be okay as long as that is the only item on the table while lifted. Yes, the table looks larger than you think and the quality is great.